Ancient Mysteries Explained; The Blog: Were high ages in antiquity possible because of less gravity? Were high ages in antiquity possible because of less gravity? This possibility of living thousands of years or hundred of years is normally interpretated differently; it does not fit the present paradigm about ancient cultures. It is than calculated towards more credible numbers, reasoning that they might not have been calculating in years. Still these references to longer lifespans exist. What if these numbers were actually for real? Alfredo Gamarra found during his research an interesting reference that could explain longer lifes in the past. Based on his idea that gravity in the past was less, he heard about the Russian astronauts that were for a long time in space, and of whom it was detected that the process of cell renewal slowed down significantly in space. Reasoning that we only have a limited number of times that we can renew our cells, and that this number defines how long we could live, it is logic to think that one could live longer if this renewal process is slowed down. 'Bone and Muscle Loss - Weightlessness triggers bone mineral loss, where the density of weight-bearing bones (e.g., pelvis and leg bones) declines at the rate of one to two percent per month. Mimicking osteoporosis, the process begins with the atrophy of large weight-bearing muscles in the legs and reduces the torsion and compression on attached bones. The result is greatly reduced bone renewal and possibly a greater risk of forming kidney stones. Moreover, the heart will also lose muscle mass and weaken. 'In van Andel-Schipper's case, it seemed that in the twilight of her life, about two-thirds of the white blood cells remaining in her body at death originated from just two stem cells, implying that most or all of the blood stem cells she started life with had already burned out and died. 'Is there a limit to the number of stem cell divisions, and does that imply that there's a limit to human life?' asks Henne Holstege of the VU University Medical Center in Amsterdam, the Netherlands, who headed the research team. 'Or can you get round that by replenishment with cells saved from earlier in your life?' she says. The other evidence for the stem cell fatigue came from observations that van Andel-Schipper's white blood cells had drastically worn-down telomeres – the protective tips on chromosomes that burn down like wicks each time a cell divides. On average, the telomeres on the white blood cells were 17 times shorter than those on brain cells, which hardly replicate at all throughout life. 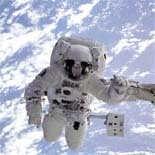 Of course in the case of astronauts, this loss of bone mass and slow recovery of injuries can be seen as negative effects. On the other hand it can be reasoned that one would not need the same bone mass in space. It is like a re-adaptation of the body to circumstances with less gravity. Life in the water has also less bone mass; most fishes have only cartilage except the biggest ones that develop some considerable bones, but less massive of course than similar sized land life. Did you know that astronauts are up to 2 inches taller while they're in space? As soon as they come back to Earth, though, they return to their normal height. What happens in space is not an optical illusion, but one more example of how microgravity affects our bodies. Imagine that the vertebrae in your back form a giant spring. Pushing down on the spring keeps it coiled tightly. When the force is released, the spring stretches out. In the same way, the spine elongates by up to three percent while humans travel in space. There is less gravity pushing down on the vertebrae, so they can stretch out - up to 7.6 centimeters (3 inches). So theorically, if gravity would have been less in earlier times, the effect of gravity force on the human body could explain 2 mysteries of the past, one of the high ages, and the other one the existence of giants! With this principle of less gravity in the past in mind, one could also see the giant scale and the not yet understood sophisticated technology of ancient sites, in another light. Don't forget to download the ebook 'The Discoveries of Alfredo Gamarra', give me the like on the fanpage so you can download it! atmospheric pressure would have been lower. it goes along with less gravity. More gravity means a bigger atmosphere. More gravity won't allow bigger species than we have now. Jan, I am contending in my upcoming book that so called 'Gravity' does not actually exist as postulated by Newton, but that the Force observed is in fact 'Charge Density of the Electrostatic Field'. Charge Density is variable, and is effected by various events. The most notable by either incoming (positive) or discharge (negative) toward a close encounter passing planet. In the case of a tremendously massive incoming 'thunderbolt' strike, as evidenced by the 'Great Blue Eye of the Sahara' could, and probably did change (increase) the Charge Density by several factors. We know without question that Giants in all forms of Flora and Fauna have flourished to suddenly go extinct, the most recent of which were the 2 mega cataclysm, one the Younger Dryas impact event of -12,800 YBP and The Last Great Cataclysm -7,000 years ago.